We’ve developed the MTI Relative Strength Assessment and Endurance Assessments for Military Athletes and Wildland Firefighters. 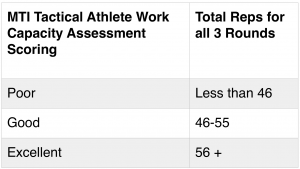 Finally, I can announce the MTI Work Capacity Assessment for Tactical Athletes – Military, LE and Fire/Rescue. I’ve been mulling this assessment over in my mind for several years and it’s been a significant hole in our theory. In our mind, the tactical events which demand the highest work capacity are when things are most dangerous. For Military and LE athletes, this equals movement under fire. For Fire/Rescue athletes (wildland and urban) this equals rapid egress from fast-moving fire. As well, all tactical athletes are loaded with body armor, protective gear, hand tools or firearms, packs, etc. Anyone who had done burpees or sprints unloaded, and then added an IBA or weight vest and repeated the effort, understands that the strength demands and corresponding work capacity demands of loaded movement are significantly greater than unloaded movement. Finally, definitely for Military, LE and Urban Fire/Rescue athletes, this movement will include repeated level changes – from the ground to the feet. In addition, the duration is a consideration. We’re looking for maximum effort – which can only be sustained for so long. 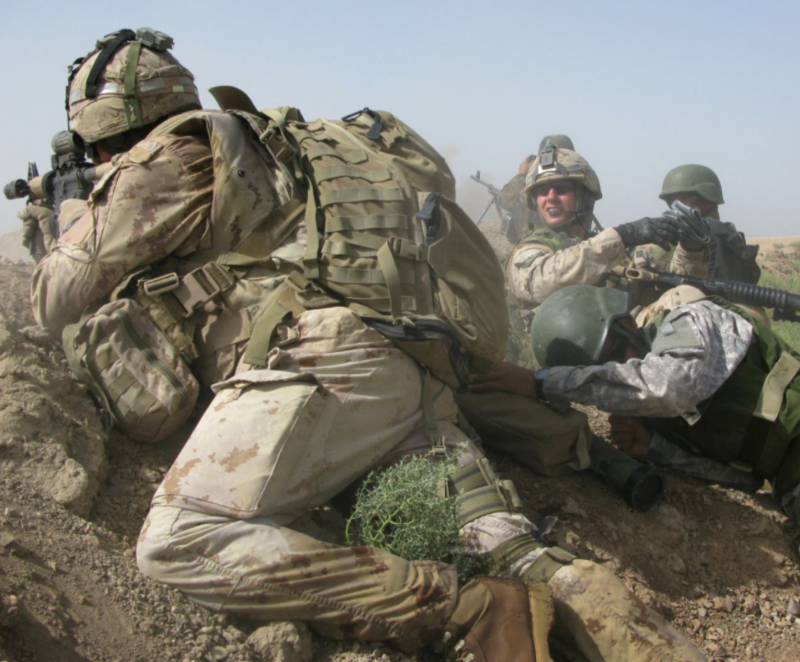 Also, often firefights and other dangerous tactical work capacity demands can involve periods of intense work, followed by a short respite, followed by another period of intense work, etc. Below is the assessment we developed. 1x Rep = 1x 25m length, so a round trip = 2x Reps. Only full lengths count. The athlete starts on the ground prone and must drop to the ground prone at each turnaround. In general, when building assessments, we want to keep the assessment and scoring as mission-direct and as simple as possible. This assessment tests the two primary work capacity modes faced by tactical athletes when things are most dangerous – repeated sprinting under load, and level changes. The total work duration is 9 minutes. By splitting the effort into 3-minute increments divided by a 1-minute rest, we’re able to keep the effort at a high intensity, as well as test the athlete’s ability to recover rapidly from intense work demands. Of the 20x athletes tested at Schofield, 2x scored “poor”, 16 scored “good” and 2x scored “excellent.” The average final score was 49.9. See the video for soldiers completing the assessment. Uniform for the assessment is PT gear, but several of the soldiers chose to complete it in boots/cammies. It’s up to the command.